I was running slightly late for work this morning, but couldn't resist snapping a quick picture of this sight when I glanced out my living room window. When I say it was right outside my window, I'm not kidding. 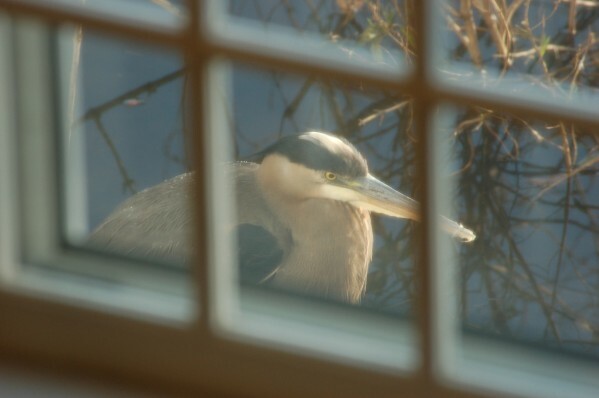 The heron was so close I couldn't take a chance and go anywhere near the window for fear of scaring the bird off. I ended up standing halfway up my stairs and used a 400mm telephoto lens. Who would have thought I'd ever being using that lens in close quarters in my livingroom? Of course, since I took the time to write this, now I'm really late for work.